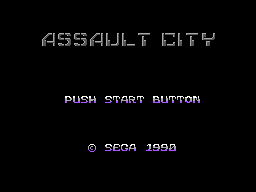 Assault City is a shooting game developed by Sanritsu and published by Sega for the Sega Master System. There are two versions of the game: one which requires the use of the Light Phaser peripheral, and one which can be played with a Control Pad. Main article: Assault City/Magazine articles.